A Personal message from Clive Hart. Who said that local politics wasn't interesting? It's obviously all happening in Cliftonville West! Please find below a letter I sent to the ‘ local ‘ Chief of Police yesterday. Since sending the letter I have been informed that changes are planned to policing in Thanet. If you therefore share my concerns it is important that as many organisations, businesses and individuals as possible write to the Chief Superintendent at Margate Police Station, Fort Hill, Margate CT9 1HL to express them. It is also now even more important than ever to report "every" single crime, as it is upon the local crime statistics that policing levels are based. Please forward this email to every organisation, business or individual that you know in Thanet. Thank you for your valuable time. " I am writing with reference to strong rumours circulating at County level in regards to the possible scaling down of Police services at Margate Police Station. 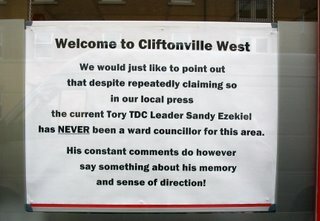 I am also a district councillor for Cliftonville West and I have discussed this matter with my close colleagues Cllrs. Linda Aldred & Doug Clark JP (Cliftonville West) and Iris Johnston and John Watkins (Margate Central) who have also asked me to write to you for clarification. We know from the Thanet Crime & Disorder Audit of 2004 that Margate Central and Cliftonville West district wards are sadly a crime hot spot in Kent. These facts were confirmed at this weeks meeting of the Kent County Council - Thanet Local Board. Your recent amalgamation of the Thanet & Canterbury Police operations worried us here locally and we found the decision to site your office in Canterbury questionable, especially in relation to crime statistics across the two areas. Moreover, we are now worried that you may be considering further cutbacks at the heart of a community where we feel we need a much stronger Police presence. Any such move could have a negative effect on a whole raft of local initiatives that are aimed at making this particular area a safer and stronger community. Can we therefore please have an assurance that services provided at Margate Police Station will not be reduced in any way? Cllr. Hart's letter is amazing, given that for 9 years his socialist government has encouraged freedoms without responsibility and ploughed BILLIONS into supporting and regenerating communities. The result has been a seemingly unstoppable spiral towards the breakdown of our society as we know it and where law breaking and anti-social behaviour are an increasing threat to our everyday lives. It seems that money is available for anyone who is not/will not support themselves, but that protection from the excesses of those who will not control themselves is not in the budget. You would be better Cllr.Hart, writing to your Home Secretary and your Prime Minister to beg for more resources on our behalf, than to the Chief Constable, who clearly does not have enough funds to provide us with the protection to which we are entitled. Or perhaps you think that ordinary hard working English bloke and family are not as worthy of help as unemployable yob, one parent teenage mother, lazy adult with sick note and disability benefit, asylum seeker, economic migrant,......? There is ample evidence, provided on this site day after day, that the police are not under-resourced, as they constantly claim, but are simply inefficient or, worse, lazy. They seem to pick and choose which reports to respond to and which alleged crimes to follow up. I do not believe that this county needs more resources for its police service; they should just get off their backsides and WORK. Are you suggesting, Anon 330, that it is wrong to spend money on community regeneration? Or are you suggesting that it is fine as long as the money is spent on communities and people of whom you approve personally? It does seem that the balance is heavily weighted in favour of the disadvantaged, even if they are disadvantaged because of their own criminal behaviour, laziness or stupidity. I don't know how they could reduce the service from Margate Police, its already non existent as far as I am concerned. I put a call in about some violent crime against 2 elderly men 9 days ago and am still waiting for a response. The Anti Social behaviour unit at TDC is no better, still waiting for a reply from them. Mind you with Nigel Cruttenden at the head of it I am not surprised, I am told he is an excopper, and perhaps has brought the same ethos to the job as in the intitutional denial of service regime that exists at the Police Station. "what do you expect in that road?" I found the post on here about the fact that the new Superintendent of the merged police is now based at Canterbury very interesting. So there is no one really in control on site at Margate now? The monkeys are running the zoo. I read Cllr Harts letter yesterday morning. It took me 4 minutes and one phone call to learn the truth behind his (yet again) self serving publicity seeking pronouncements. This is a false allegation from a man desperate for any publicity that makes him sound important. It would appear he had time to discuss this rumour with several of his colleagues, all of whom knew no more than he did, when he could have chosen to have spoken to any of the KCC representatives who serve on the police authority for the truth. The truth is we all know that Kent police have reorganised into 6 areas from 9; we have known for some time that the new commander of this area joined with Canterbury would be based there; that there is still a local commander; that this team has already taken sone police officers off admin tasks to put more officers on the streets at weekends when needed etc etc. Some further change, particularly as I understand it, of Sergeants and Inspectors will follow. In view of the apparent beaking down of law and order on our streets, could Chris please give us some answers on policing and the various warden responsibilities. There has been a lot of talk recently about diminishing numbers of police Officers, and the introduction of Community Beat Officers and TDC Community Wardens. What are the rolls and responsibilities of the these various positions, what powers will they respectively have, and what chenges have there been in policing numbers? I think this says clearly that all Cllr Clive Hart cares about is massaging his hefty ego. He's in charge of the Cliftonville and Margate Central operation for Labour and is planning a dirty campaign against the Conservatives next year. Is anyone really that suprized with the Labour tactics and strategy...Im not. Id like to see a proper debate about the future of Thanet and I suspect that the 120,000 or so residents in Thanet want to see that too. Why is Cllr Clive Hart avoiding this and making it a personal problem with Cllr Ezekiel? I do hope, Mr Maskell, that you are not going to use this site as your own Tory campaigning vehicle - though you have been doing so up to now, so I guess it will be more of the same. The majority of those who post comments on this site clearly think that the present Tory Administration is inept, poorly led, and indifferent to the needs of local people. The Dreamland fiasco is just one issue that demonstrates this point. Some go further to suggest that the ineptitude extends to paid officials, and some go even further to suggest that Council Members seem "weak" alongside certain local business interests. You will understand the implication here. That is the substantiation and legitimacy for Councillor Hart's approach. As for "fighting a dirty campaign", you seem to making a start there with your rude personal comments about Councillor Hart. There is no legitimacy to any approach that takes a rumour, fails to cross check it with anyone who may know the truth, and then turn it into a publicity hunt. That is deplorable by any standard. I do not know enough about the ins and outs of policing locally to give an immediate answer to the question about powers and forces. I will, however, endeavour to find out. Don't make me laugh Anon 5.45. The last Labour administration was far more inept and indifferent to the needs of local people than this lot are. They got lucky on Westwood Cross and the Christchurch Campus, but certainly did not make the best of all the grant aid that was handed out during their 8 years in power. That's why they got kicked out wasn't it? Sandy Ezekiel has a vision for Dreamland which extends beyond a 2 month season and a few weekend openings, and looks like he is prepared to hold out until he gets an all year round attraction/facility. As a Margate resident, I don't see that Dreamland affects me in a positive way whatsoever anyway. The Labour legacy for the people of West Cliftonville was a slide that a KCC report referred to as "a community on the brink". Failed Planning Policy and complete blindness to the effects on local residents which saw HMO next to children's home, next to crack house next to rehabilitiation home for adult offenders, etc., etc.. They may not be the greatest Council in the country, but they are far better than the current Labour bunch. I have lived here on and off since 1961 and full time since 1993 - I can honestly say that there has been no positive difference I can see between TDC controlled by either Labour or Conservative except Labour did some crazier things than the Conservatives who don't seem to really be providing the sort of service we need to improve the place. Let's face it - Margate is a dump to live in, you can't get the Police or the Council to take any effective decisive action to stop it being a dump. The last darn thing we needed was to have wasted millions of £££ on the Turner Centre, and we certainly don't need to spend millions more. We are a laughing stock as a result of the Turner fiasco. Am I right in thinking Labour started it and the Conservatives are finishing it off? Only a few arty types and the Councillors want it, the rest of us just want cleaner streets and low crime. Anon 703, I was merely playing back the tone and direction of most comments on here. I have read many commentators referring to "sweeping changes" that (they hope) will occur at the next Council election, for example. Dreamland is an often quoted issue and you seem to be a minority voice in thinking that Ezekiel has any sort of vision for Dreamland. As for Labour losing power locally, they ACQUIRED it as part of the massive swing against the Tories nationally in the mid/late 90s. They lost it when that swing faltered; it had little to do with local performance. It rarely does. Thanet, despite its areas of deprivation, is a naturally more Tory area, and the current political status is therefore more of a "norm". And interesting that you refer to Labour "getting lucky" over Westwood Cross - an apparently positive assessment - when another post on here covers local MP Gale's complaints about it. Anon 5:54pm, I disagree. Thats not a justification for a personal campaign against Cllr Ezekiel. 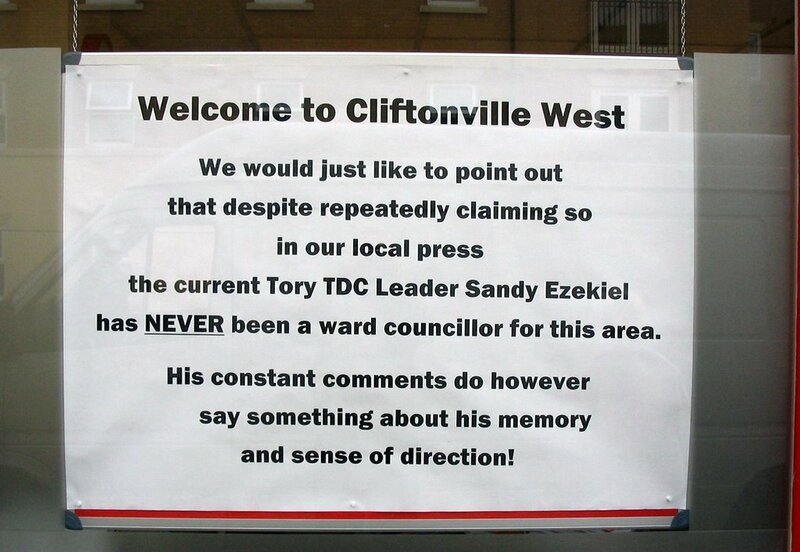 Is Cllr Harts election campaign going to revolve around criticising Ezekiel for not being the Ward Councillor? Cllr Hart, youve posted a letter through residents doors already saying what youve said here. Youve made your point. Well done. Move onto bigger things like the issues affecting Cliftonville West. Interesting first comment here. More people disagree with me on this site than agree with me. Are my views any less important or noteworthy because I am involved with the Conservatives? I dont think so. On behalf of the Police Officers in Thanet and Canterbury I have to say they are working very hard to give the service expected by the community they serve. The buracracy within the system can sometimes of course give cause for delay in attendance. Police prioritise calls, with the lack of staff this can sometimes mean delays as the urgent calls are dealt with first. Officers DO NOT sit on their backsides and do nothing. The Police will never get everything right. They are servants of the people. If they stop a driver for speeding, or no seat belt or cyclists on the pavement they will be met with "Havent you got anything better to do like catch murderers?" They forget the law is the law, and yes sometimes getting caught for breaking it is no excuse. I would believe that the merger with Canterbury will bring extra resources into Thanet to deal with the demand. This would only be to the detriment of Canterbury, Herne Bay and Whitstable. If 3.30 was talking from a point of knowledge not guesswork, or ask the horses mouth they would not use just RUMOUR CONTROL. Yes we are all concerned what this merger with Canterbury Police will mean to the service delivery. The trouble with policing just like the merger of Kent & Sussex ambulance trusts, The Police, Ambulance and Fire Service are now sadly run by accountants not practitioners. Whereas the Tory Group are just not funny. Inept, totally disinterested in the area, utterly self-serving, enjoying the gravy train, but nope, just not funny. labour had eight years in power in thanet and done nothing and have the cheak to run done the council now,you only have to read there letters in the press ,well you form your own thoughts .